WP Video Robot is a powerful solution that allows you to create WordPress automated video website without any effort! Thanks to its automated schedule system, it makes sure your site stays fresh and updated with the best and most popular videos. You can sleep soundly, WP Video Robot does the job for you! We have successfully tested it with Mac, Windows and Linux. We also have tested WPVR with popular web browsers. You are currently reading it ! The plugin files are in wpvr.zip, the folder "wpvr" should be placed in the /plugins directory of your WordPress installation. Instructions below. 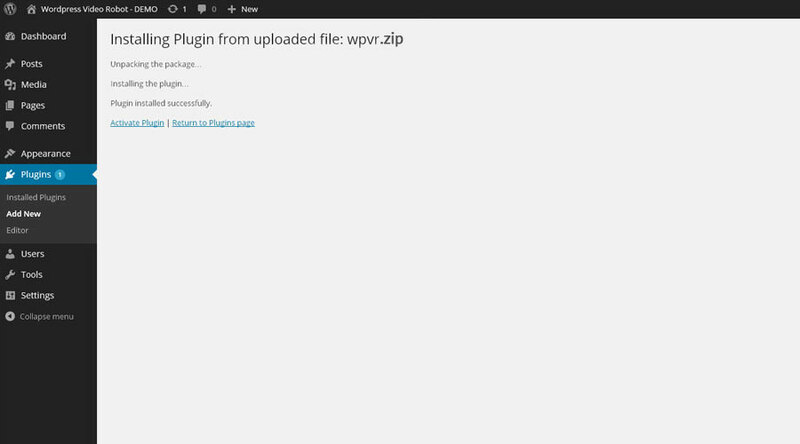 Head to Plugins > Add new, then click on "Upload Plugin"
Select the extracted zip archive "wpvr.zip"
That's all ! You are ready to use WP Video Robot. Meanwhile, to get the automated functionality to work, Please configure the plugin from WPVR Options Page. If you are having trouble using the default WordPress installer you can upload the plugin via FTP. Open wpvr.zip file and unpack all the plugin files to a directory on your computer. Open your favorite FTP program ( such as Filezilla ) and connect to your server. If you don't know your login details, your hosting provider can help you with that. Upload this directory to the /wp-content/plugins directory of the WordPress installation on your server. Go to Plugins > Installed Plugins in the WordPress administration. You will see the plugin you just uploaded. Click on the Activate button and you are done. To use the plugin and be able to update it, you first have to activate your license. You should have your CodeCanyon purchase code near before continuing the activation. You can find it in the CodeCanyon receipt or you can get it by following this tutorial. Enter your email and your purchase code on the popup shat shows that appears on each page of the plugin. Click on Activate my copy to proceed. You're done ! Now you can use the plugin and update it automatically each time a new version is released. To use the automatic plugin updater, your copy of WPVR must be licensed and activated. You can easily find your purchase code in the zip file you downloaded from codecanyon. Once they are entered and we issue a plugin update, you will receive a notification message in your WordPress admin “Updates” or “Plugins” section. WordPress checks for new updates every 12 hours. Follow the onscreen prompts to update the plugin. Open your favorite FTP program ( such as Filezilla ) and connect to your server. If you don't know your login details your hosting provider can help you with that. Filezilla will show a dialog warning you that the files you are trying to move to the server already exist, check the "Overwrite" radio button and also check the "Apply to current queue only" checkbox. Click OK and the files will start uploading and overwriting the old ones. Login to your website admin panel when uploading is finished and make sure the plugin is updated by going to Plugins > Instaleld Plugins and checking the version number. Backup Your Current Setup ! Whenever you update the plugin, just like upgrading any major software, it’s always a good idea to make sure that you have a current backup of your web site, including your wp-content folder, your wp-config,php file, and your .htaccess file in your WordPress installation folder, and a copy of your WordPress database. You can use these to revert back to your original site if something unforeseen happens during the update process. WP Video Robot fetch videos using sources. You can use unlimited number of sources, toggle them ON or OFF, test them manually or run them. You can define and use as many sources as you need. You have a lot of flexibility when it comes to define a source. Different tabs makes it easy for you to navigate between your source settings. You can set any of your source options to Default, then define it from the WPVR Options Panel. This way, you can change hundreds of sources settings with a single click. First, add a friendly name for the source. Then choose one of the available video services. The plugin is shipped with Youtube, Vimeo and Dailymotion. If you need to import from another video service, check out our store. 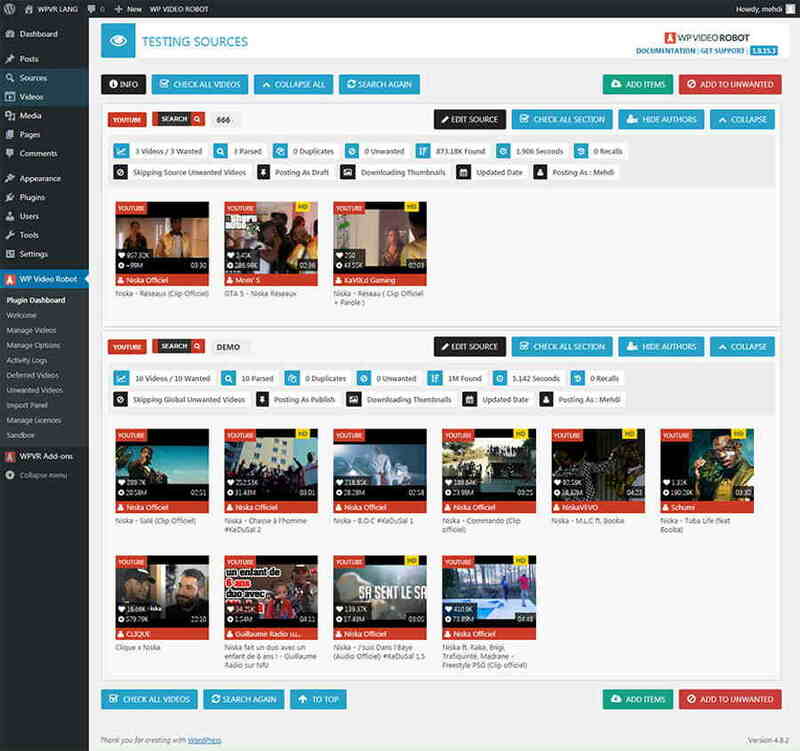 Then pick a source type among the possible values available for the selected video service. Fetch for videos by search terms. Video Service : Youtube, Dailymotion, Vimeo. Fetch for the most trendy videos of the last hours/days by country. Video Service : Youtube, Dailymotion. Param : Pick a country from the list. Get all videos included in a public playlist of videos. Param : Unique Playlist ID or Comma separated Playlist Ids for Youtube. Get all videos included in a public channel. For Youtube, you can grab this ID form its owner username with the form below. Video Service : Dailymotion, Vimeo. Param : Unique Video ID or Comma separated Video Ids for Youtube. Get all the videos posted by a user. Video Service : Vimeo only. Param : Unique Vimeo Username . Then pick how many videos you want this source to get per execution. Is the number of wanted videos on each source call. For performance purposes use small number, and remember that WP Video Robot will pass by in the next hour to get more videos. Relevance : Get the most relevant search results first. Date : Get the most recent videos first. Views: Get the most viewed results first. Title: Order results alphabetically by video title. Rating (NEW) : Get the most rated videos first. You can choose either to skip videos that have already been imported or not. 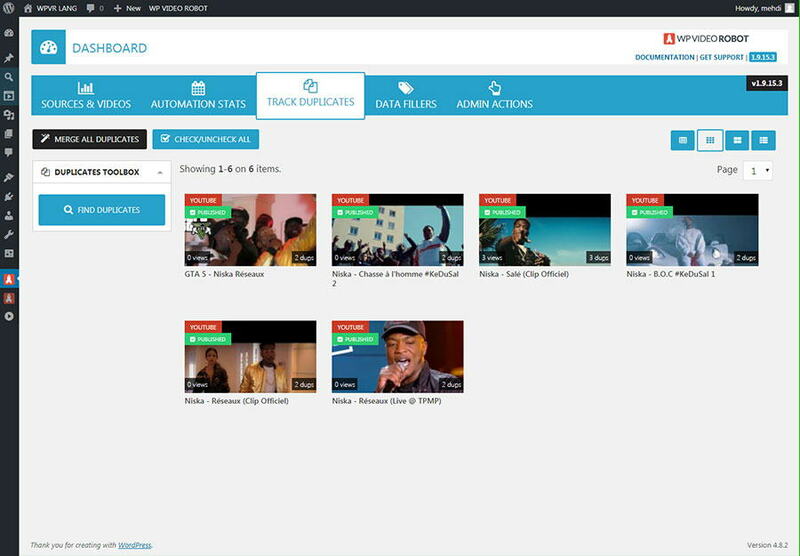 Skip Duplicates : Import only new videos, skipping existing ones. Do Not Skip Duplicates : : Import videos even if they already exist on the site. 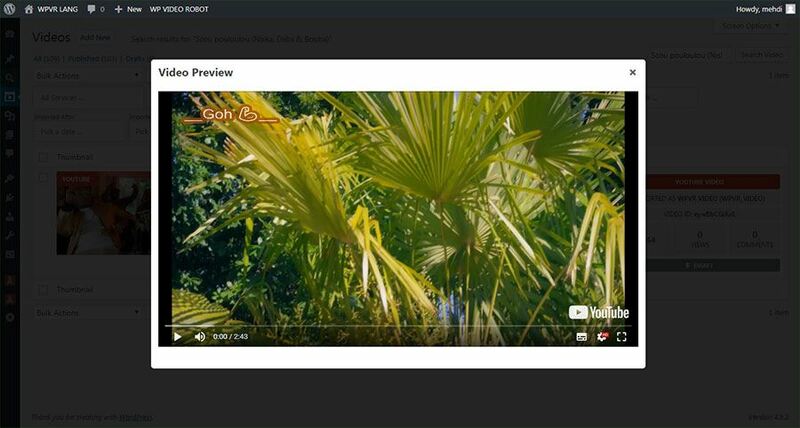 The plugin allows you to remember bad or junk videos you come across, and don't want to import. We called them unwanted videos. You can define unwanted videos globally or on a source basis. Here you can define whether to skip this source unwanted videos only or the site global unwanted videos. You can choose either to grab other Youtube data or no. ( Video Duration, Video Likes, Video Dislikes, Videos Youtube Views, ...). If you face performance issues, turn off this option. You can choose either to grab the video meta keywords tags or not. Video tags are very useful when you try to improve your site and videos SEO rankingsa. You can narrow the fetching results to videos that have been published after a certain date only. Leave empty to ignore this criterion. Supported by Youtube and Dailymotion only. Custom : Define the date for this source only. You can narrow the fetching results to videos that have been published before a certain date only. Filter fetched videos by duration. Note that this works only for Search sources. Supported only by Youtube and Dailymotion. Filter fetched videos by quality and definition. You can choose whether to get only live streams videos (currently live or completed lives). You can choose to download the video thumbnail during the video import, or use the external thumbnail from the video service server. Using external thumbnails makes the sources executions 5x faster, but could need some code tweaking to integrate with your theme. Downloading the video thumbnails is good for SEO but requires more disk space and makes source executions slower. You can define the post status that will be automatically assigned to all the videos imported by this source. You can, for example, import videos as draft until you review and publish them. You can pick one or more WordPress categories that this source should auto-post to. This is a great way to classify and order videos on your site. Choose the WordPress user to whom WP Video Robot will assign this source imported videos. Choose to add the name of the source or a custom text before or after the video title. You can define the additional WordPress tags that should be automatically assigned to this source imported videos. You can define whether to use the video service description as the post content for all this source imported videos. You can define here, for all this source imported videos, the number of seconds from the beginning of the video, the player should start at. Supported only by Youtube. You can define here, for all this source imported videos, the number of seconds from the end of the video, the player should stop at. Supported only by Youtube. You can disable from here, for all this source imported videos, the video player title. You can disable from here, for all this source imported videos, the annotations that show up in the video player. Here you can see what has been achieved by your source during the past 30days. You have a chart for each source execution type: Testing, Tunning and AutoRunning. You can toggle off the autorun of your source from this select. Run this source each and every hour. Run this source once day. You will have to choose an hour. Run this source once a week. You will have to choose an hour and a day. Since version 1.8, you can organize your sources with ease. Source folders are like categories for sources. You can get here a quick overview of how many many times the source have run or how many videos it imported so far. Wanna see what kind of videos have been fetched by your source? Test it ! 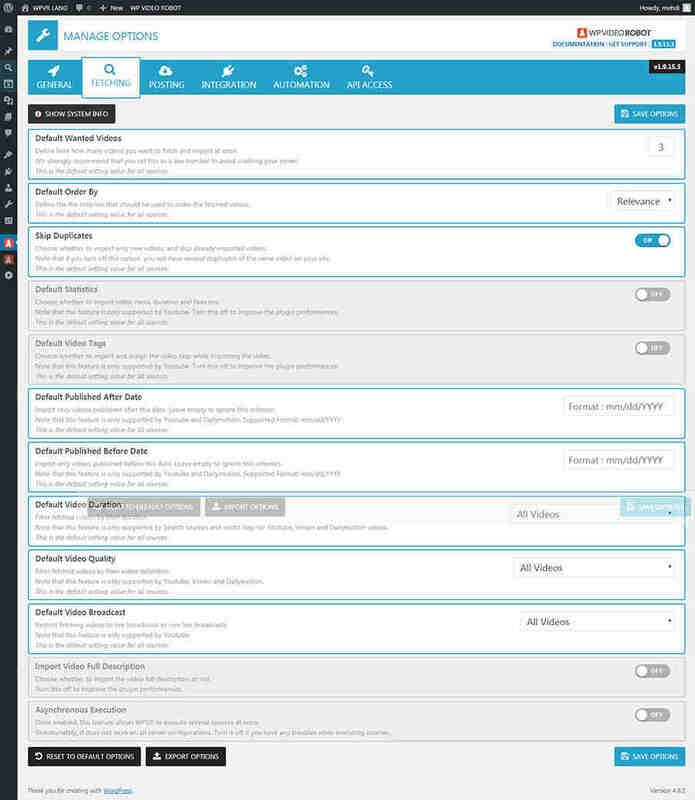 Right from the Source edition screen, under Source Actions you can click on TEST SOURCE. On the sources listing screen, click on "TEST SOURCE" button. You can test more than one source at a time. On the sources listing screen, select the sources you want to test, then choose "Test Source(s)" on the bulk actions dropdown. Click Apply. Since the version 1.8, sources can be are tested and executed asynchronously. In human language, that means that the plugin process them simultaneously, in parallel. You can turn that feature off, by heading to WPVR General options, then scroll all the way down to the last option. Then disable Asynchronous Execution. That is a tremendous change under the hood of WP Video Robot. Why ? Simply because, now you can process 30 sources (5 wanted videos each) in 5 seconds instead of 5x30 seconds. Note: If you encounter any issue testing or running sources asynchrounously, it means your hosting does not support that feature. Simply turn it off. 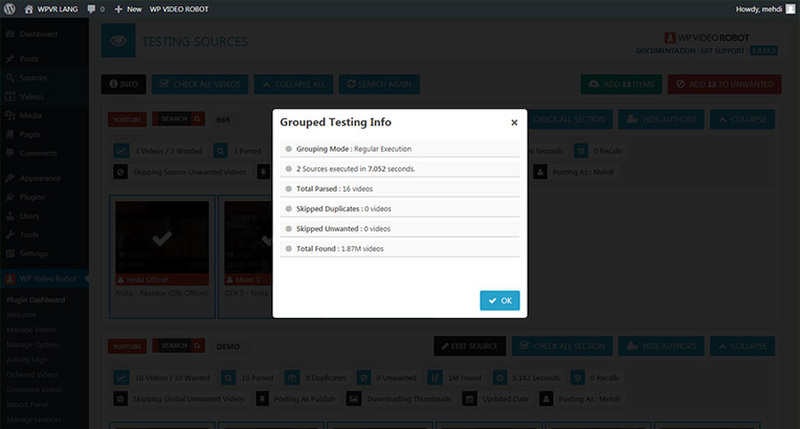 To see how grouped sources are processed, you have now a INFO button on top of your testing screen. You then just have to select the videos you want to import and then click on "Add Selected". If you find videos that are not relevant and want the plugin to skip them automatically on next executions, simply select them and click on "Add to Unwanted". You'll then to choose on which unwanted list you want to add them. Global Unwanted: All the sources will be skipping those unwanted videos. Source Unwanted: Only that source will be skipping those unwanted videos. So you can still get them using another source. Running a source is equivalent to test a source, but all found videos will be added without asking your permission :). Toggle the status of the selected sources. Test the selected sources at once. Run the selected sources at once. Export the selected Sources into a json file. Deletes the selected sources permanently. Since version 1.8.6, an import assistant has been introduced to make adding a single video really easy. 1/ Choose the video service you want to get videos from. 2/ Enter the video URL or the video ID. 3/ Pick the video data you want to import. That's it! You just have to click on IMPORT VIDEO button on step 3. Exactely as if you had clicked the blue WordPress PUBLISH button. Shows up a pop up with the embedded player, so you can preview your video without leaving your backend. Shows up the shortcode you can use to embed your imported video player wherever you want. Toggles whether that video is on the Unwanted Videos list. WPVR uses that list to know what videos should be automatically skipped during sources fetching. 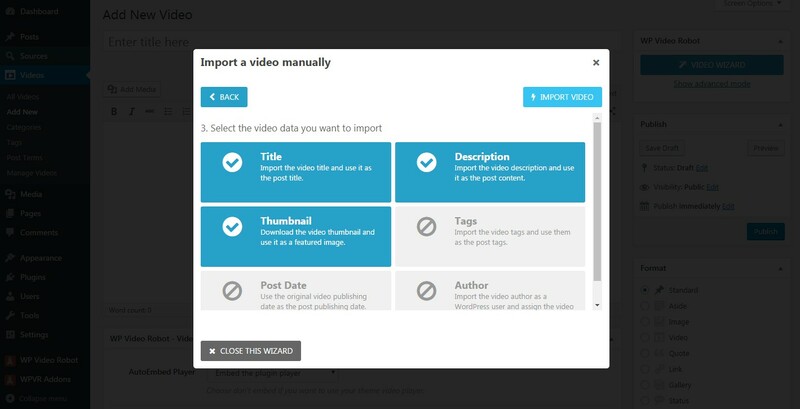 By default, the plugin will automatically embed the imported video on the text content. Sometimes, you'll want to handle that imported video as any other regular WordPress post, or even use your own theme player implementation. - Embed the plugin video player. - Do not embed the plugin video player. - Default ( use global settings set on WPVR Options > Integration ). Here you can define how many seconds should be skipped before the video starts. Here you can define how many seconds should be left before the video ends. 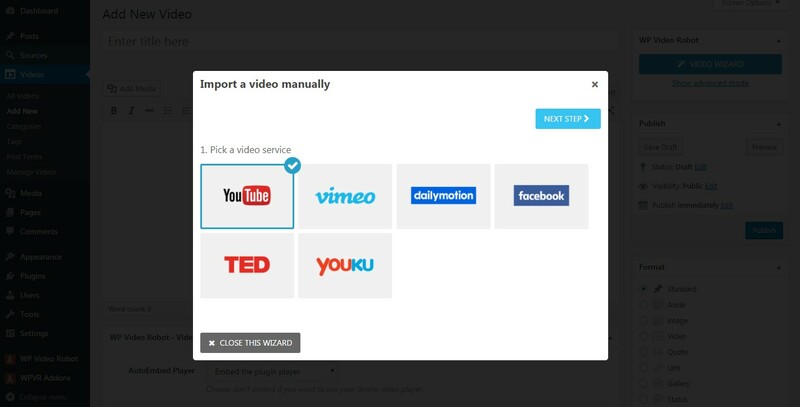 1/ Start by select the video service you want to import a video from. 4/ Choose the video data you want to get imported. Note: importing the video title for example, will override your post title input. You can also toggle all data on or off. If you want to enter your own data( title or thumbnail ,etc ...) , simply toggle off that given data. Now that you have imported your videos, you are asking yourself how to use them on your site. It's quite simple, you have 3 choices ! 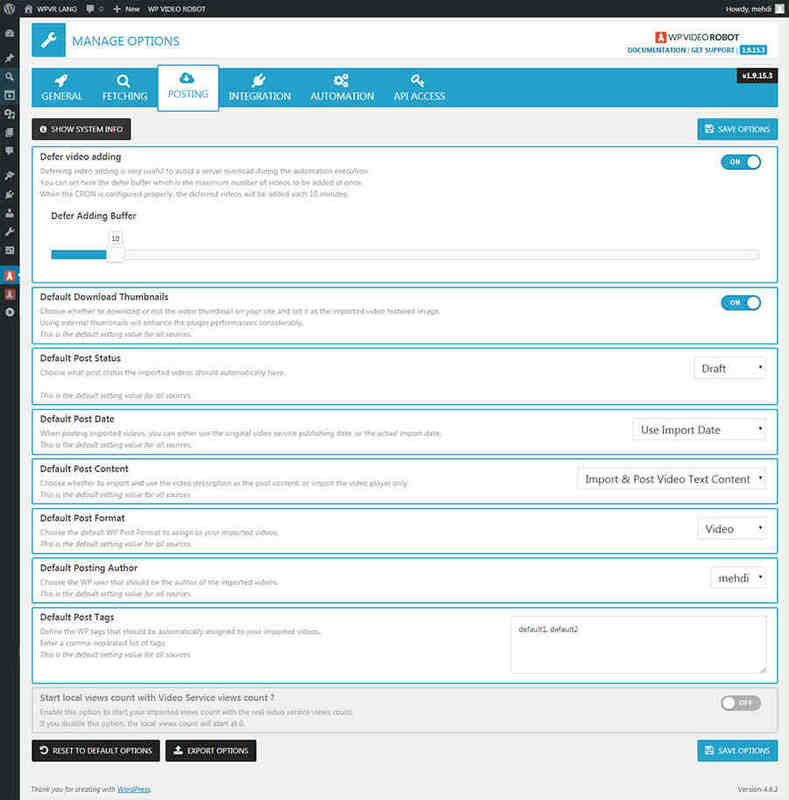 use the "Autoinclude videos in your site queries" options from WP VIdeo Robot >> Manage Options >> Integration Options. 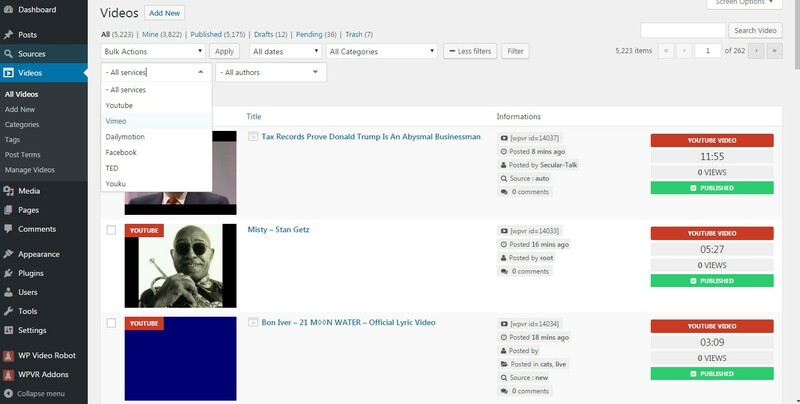 You can filter the sources list by the author of the video, and/or by video category, and/or by posting date. Will fetch, download and replace selected videos thumbnails files. Will tell the plugin to auto-include the video player right before the post content, for all the selected videos. Will turn off auto-embedding the video player on selected videos. Useful if you want to use your theme video player instead. Export the selected videos into a json file. Publish immediately the selected videos. Deletes the selected videos without moving them to trash. This action is irreversible. This is a new feature on version 1.5 ! You can manage your imported videos easily from this screen. You can track the duplicate videos and merge them or delete them. More infos on this tool. You can export all your videos with one single click using this tool. If you have exported a lot of videos and you wish to import them once at a time, use this tool. You can filter videos by check the selected videos services. You can filter videos by check the selected post dates. You can filter videos by check the selected post authors. You can filter videos by check the selected post status. You can order results by video title or by video posting date. Once you checked your selected videos, you can apply a bulk action on them. The advantage of the bulk actions on this screen, is that the action is applied on one video at a time. Very useful for huge number of videos. You can change the layout of the videos on this manage screen. For each result you can edit or preview the video. Simply choose the json file of exported options and click on "UPLOAD FILE AND IMPORT OPTIONS" button. Simply choose the json file of exported sources and click on "UPLOAD FILE AND IMPORT sources" button. You can either choose to automatically toggle on imported sources or no. 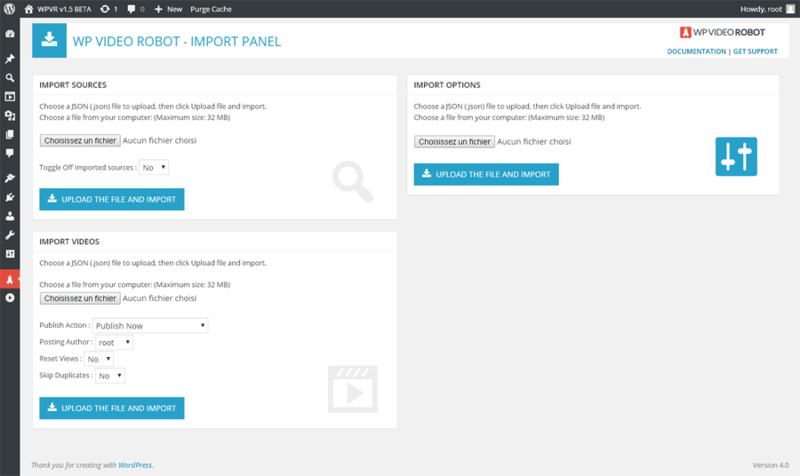 Simply choose the json file of exported videos and click on "UPLOAD FILE AND IMPORT videos" button. Post the new imported videos now or keep the original post date. Assign the new imported videos to an author. Reset the new imported videos views or no. Skip duplicates during import operation or no. 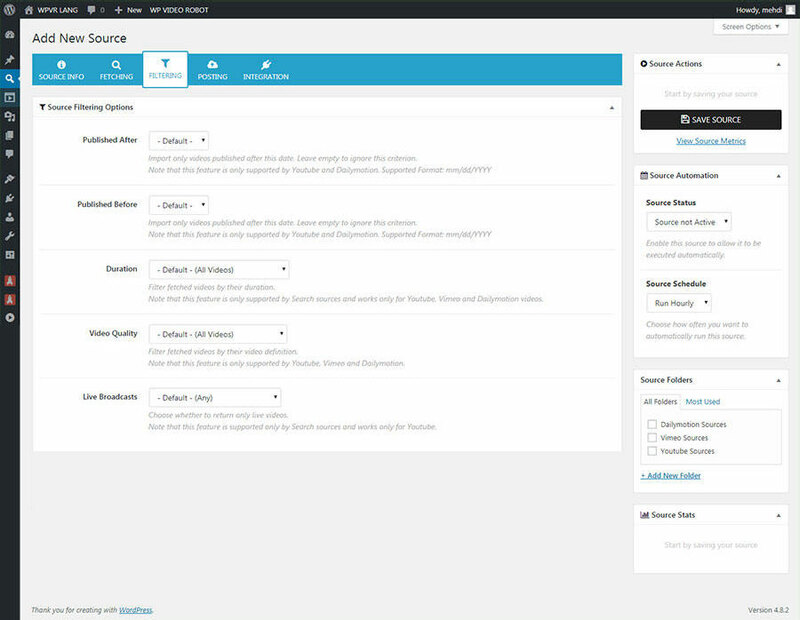 Show System Info: Get a quick overview on your system configuration. That is the first step to troubleshoot any issue you're facing with the plugin. Choose the time format to use when printing dates on the plugin interface. You can choose 12H US time format (4pM) or 24H Standard time format (16h00). Restrict edition and listing of imported videos to admin and respective authors. That's useful if you have a team of video editors that are supposed to use WP Video Robot to get videos separately. If you enable this option, the plugin will automatically flag trashed videos as unwanted. This way it will skip them on next executions. If you enable this option, the plugin will automatically flag deleted videos as unwanted. This way it will skip them on next executions. Number of log lines to display per page. Number of video items to show up per page on Manage Videos Screen, Deferred Videos screen, Unwanted Videos screen. The plugin uses a fancy fade in animation when it shows sources and videos listing screen. Some hosting configurations may not support this feature. Simply turn it off, if you encounter 'Headers Already Sent' PHP error. 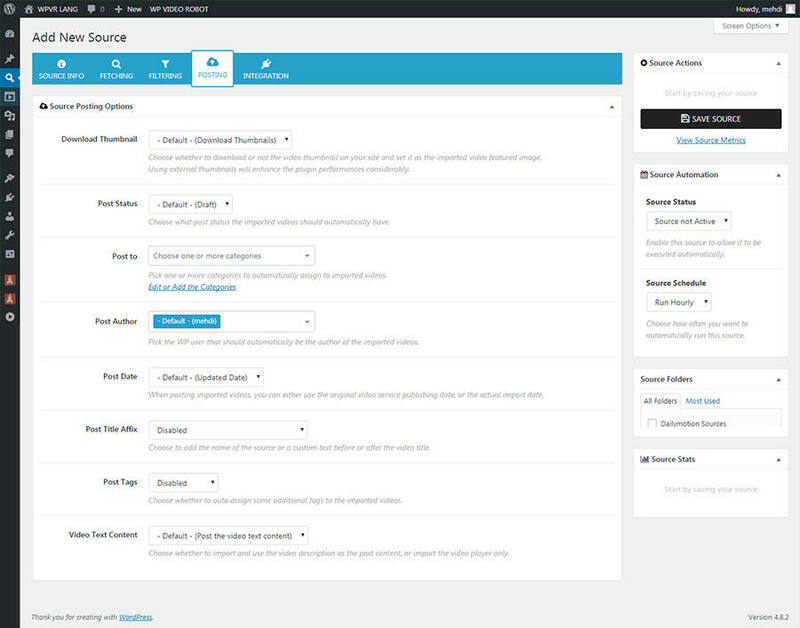 Here you can define what user roles can see the plugin menu links. All other roles will have those links hidden. Number of videos to get by default per source. Here you can set the default( meaning global ) criterion, your sources should use to order their found videos. Enable this option to import only new videos. Duplicates will be skipped. Define whether to get the video stats (views,likes,dislikes) or not. Choose whether to only import videos that are published after this date. Supported only by Youtube and Dailymotion. Choose whether to only import videos that are published before this date. Default video duration the plugin should filter fetched videos by. Choose what default video quality the sources should filter by. Choose whether to limit results to live broadcasts only or not. By default, the Youtube API truncates the video text content. Enable this option to import the whole description. Note you can improve your system performances by disabling this option. Turn this option ON to reduce the execution time of your sources. This will actually allow the plugin to execute several sources at once, in parallel. You should turn this option OFF if you encounter errors when testing or running sources. This is a very useful feature to improve the plugin performances and reduce the autorun execution time of your sources. Once enabled, you can define a Defer Buffer which is the number of videos you want the plugin to add on each execution. Let's take a real Example: Let's say we've scheduled 30 of our sources to fetch and import 5 videos per hour. If we don't use Defer Video Adding, the plugin will fetch and add 150 videos per hour. 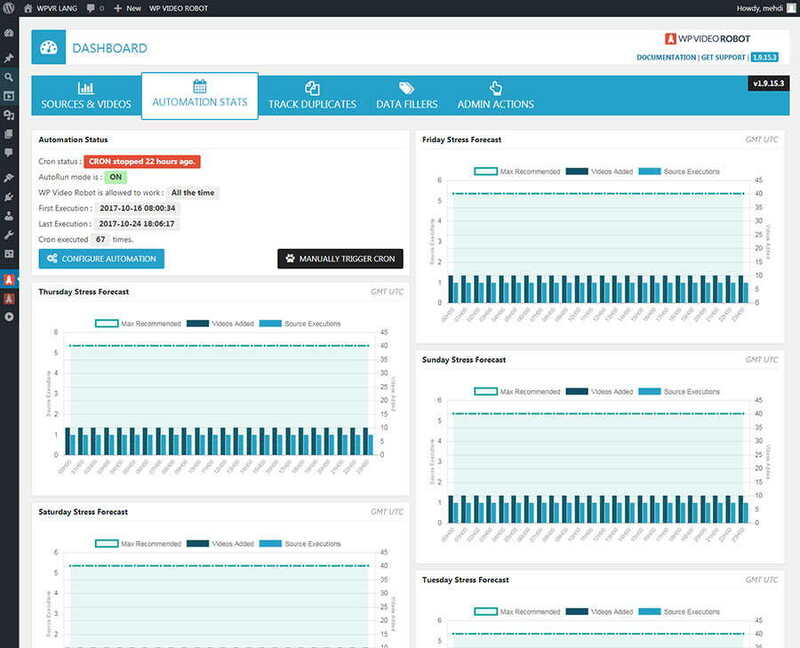 That will overload the server and decrease its performances during the hourly execution, which can be long. Now, if Defer Video Adding is enabled and we set the buffer to 5, the plugin will fetch once an hour 150 videos but will add only 5 videos each 10 minutes. It is actually a progressive distribution of your sources workload. Choose whether to download the video thumbnails or use the external ones right from the video service server. You can pick the default post status, your sources should set to their imported videos. You can pick the default post date, your sources should post their imported videos on. Original Date is the video service publishing date. Updated Date is the date when the source has imported the video. Choose whether to import by default the video text content or not. Default WordPress Post Format to apply to the imported Videos. Choose the default WordPress user to whom WP Video Robot will assign imported videos. Define the default post tags the plugin should add automatically to your imported videos. Start local views count with Video Service views count ? 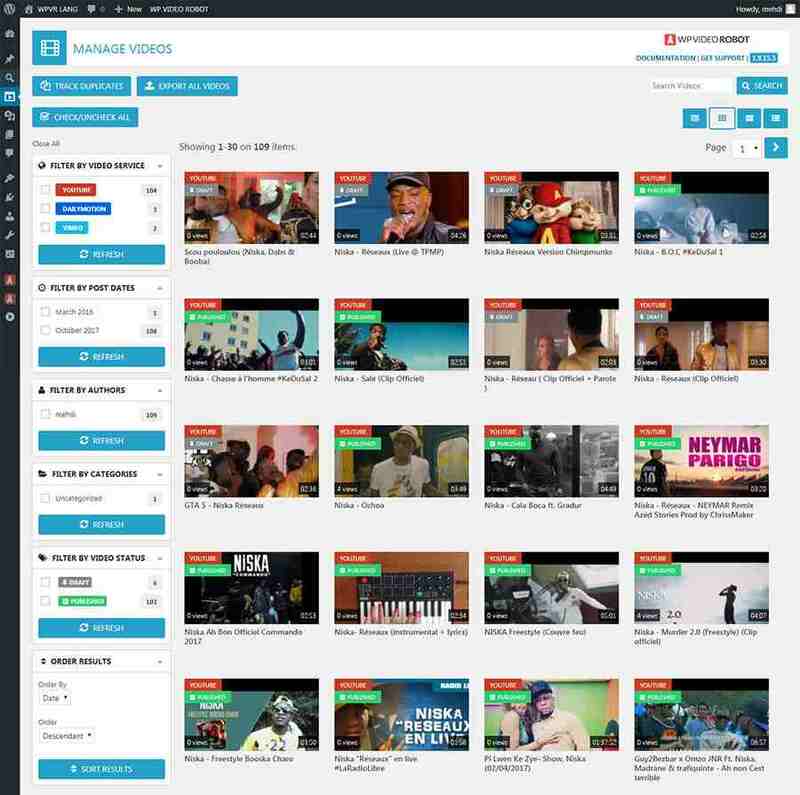 Choose whther to start your imported videos view count with 0 or with the real video service view count. Choose the WordPress Custom Post Type (CPT) that should be used to store the imported videos on your site. The plugin has a built-in CPT (wpvr_video) that is used by default. Enable this option to subjoin imported videos to all your existent WordPress queries without changing a single line of code on your theme files. Choose whether to add comments support to imported videos or not. Choose whether to show up the pause/play/volume controls on imported videos player. Works only on Youtube. 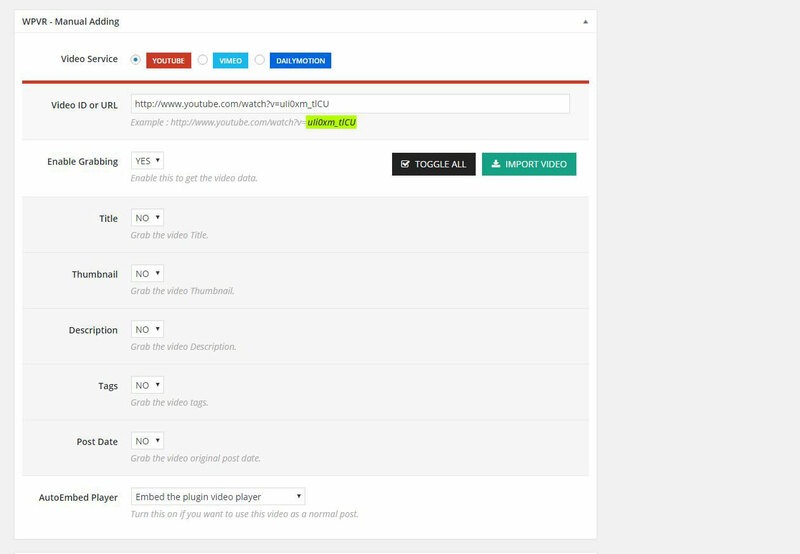 Enable this option to activate videos permalink rewrite, to have pretty permalinks for your imported videos and improve SEO. If you disable this option, WPVR will use the WordPress permalink structure. When using external thumbnails, you can enable this option to trick WordPress whenever a thumbnail is used on the frontend. Enable this option to replace in the loop the post thumbnails by embeded video players. Automatically embed youtube video player on single template without editing your theme files. Turn this off to embed the player manually so you can customize it. Enable this option to remove the video text content that usually shows up below the video player. This option allows you to enable autoplay on the embedded players of your imported videos. Choose whether to show the video title inside the embedded player. Turn this ON to prevent the embedded player from showing related videos on pause or on stop. Turn this ON to prevent the embedded player from showing annotations during the video play. Enable this option to use the WPVR fancy listing table when listing imported videos. By default, the plugin hooks into any post type query. If you notice some bugs on your site when activating the "AutoInclude Videos in your Site Queries" option, simply add the custom post types that WP Video Robot is conflicting with. If you have any trouble with that option, contact the support team on the support site. Disable this option to stop the plugin from working in background. Define a time interval of the day where WP Video Robot is authorized to perform its automated tasks. This is a very useful feature that automatically fetches and merges duplicates on your site. You can choose to run it hourly, daily or weekly. 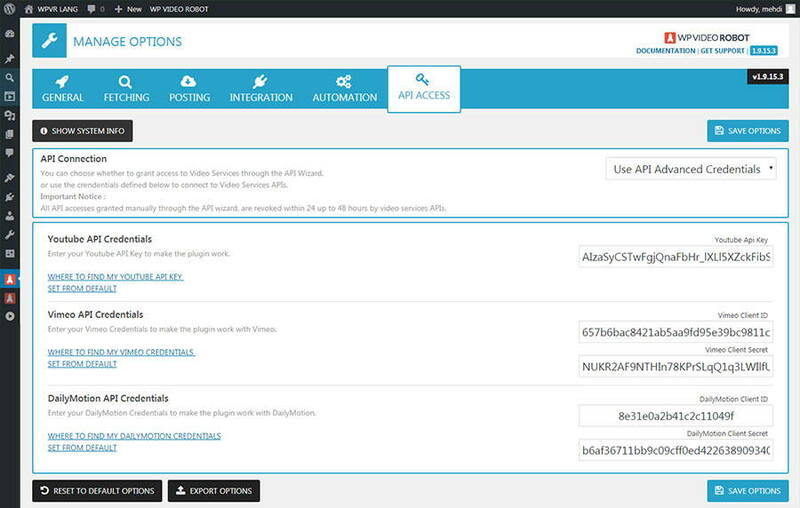 In order to communicate with the video services APIs, the plugin needs to have a granted access. You can grant access manually using the API Wizard or by switching to API Advanced Credentials where you need to provide your own API keys. Note that the access granted using the API Wizard is revoked by the video service within 48 hours. In order to allow the plugin to work automatically, we strongly recommend using advanced credentials mode. This is the easiest way to get the plugin work automatically. Autopilot is as easy as clicking on a START/STOP button. Simply purchase the WPVR Autopilot, and follow this tutorial. If your host offers cPanel backend, you can set up WPVR automation simply by adding a new cronjob to cPanel. Read more about this method on this tutorial. If you are running your website on some VPS or dedicated server, you probably have access to SSH. In that case you can set up WPVR automation using the linux crontab feature. If you can't add a UNIX cron job as shown above, you can use a free third party services like crondash.com. Important : Since version 1.8.4, we have decided to remove the WordPress built-in CRON method. In fact, that method was not working properly, since you had to wait for someone to visit your website to fire the WPVR automation. That was not efficient at all. A visual dashboard to quickly see how many sources are you using and how many videos you have on your site. On this screen you can check if the automated part of the plugin is working properly or not. Also you can visualize the performance of your plugin configuration, through a stress forecast of the plugin workloads of each hour of each day. You can even manually trigger the CRON to load the automation machine. There you can see what would be done by the plugin when it is autorunning. Since version 1.8.4, you have a new and powerful new tool to track and merge duplicates. This tool tracks several instances of the same video, and keeps only the first found one (master). It removes all the other copies (duplicates) and sums track of the views count of each of them, into the master view count. You can even merge all duplicates at once, or show up your existing duplicates and then select what duplicates should me merged. 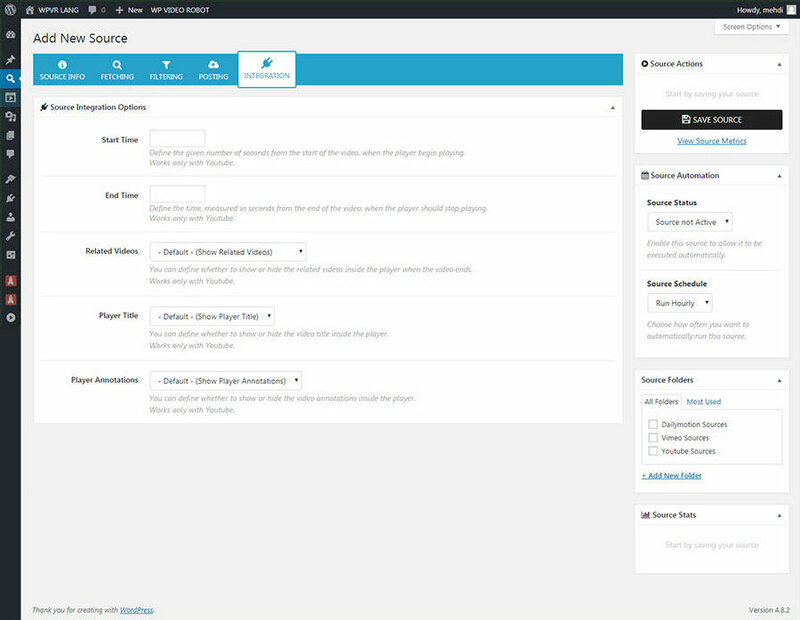 The plugin offers you the ability to fill any custom field used by you or by your theme, with a some of the video data. Custom Data : any custom string you want. This feature is powerful and very useful to get the plugin work with any theme. If you have previously imported some videos, and now have deleted them, you should tell the plugin to forget them so you can re-import them. Simply click on 'Reset Video Tables' and the plugin will hard refresh its imported videos array. 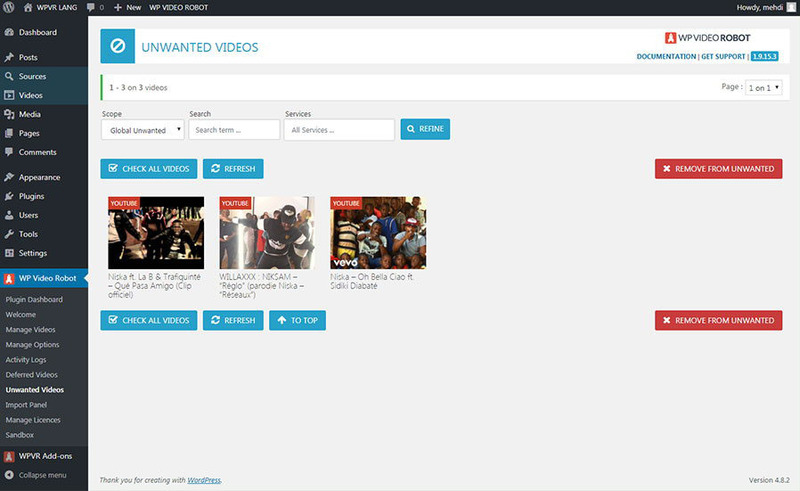 With one click, you can clear and delete all the deferred videos, the ones waiting to be automatically added. If the plugin has generated any errors during activation, they are stored to be debugged lately. Here you can show stored activation errors and clear them. When you import or export sources or videos or even options, the plugin generates some temporary files. You can bulk delete them by clicking this button. You can reset your license activation from here. You can reset the CRON security token from here. You can reset all the notices generated by the plugin from here. 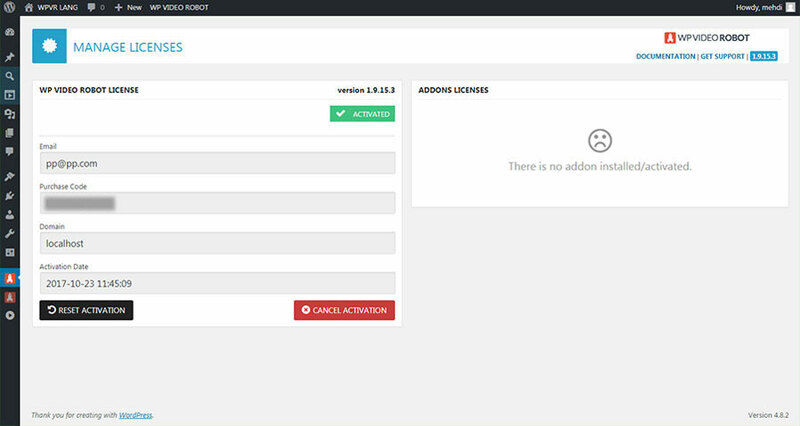 You can manage on this screen your core plugin license and premium addons you have bought on our official store. 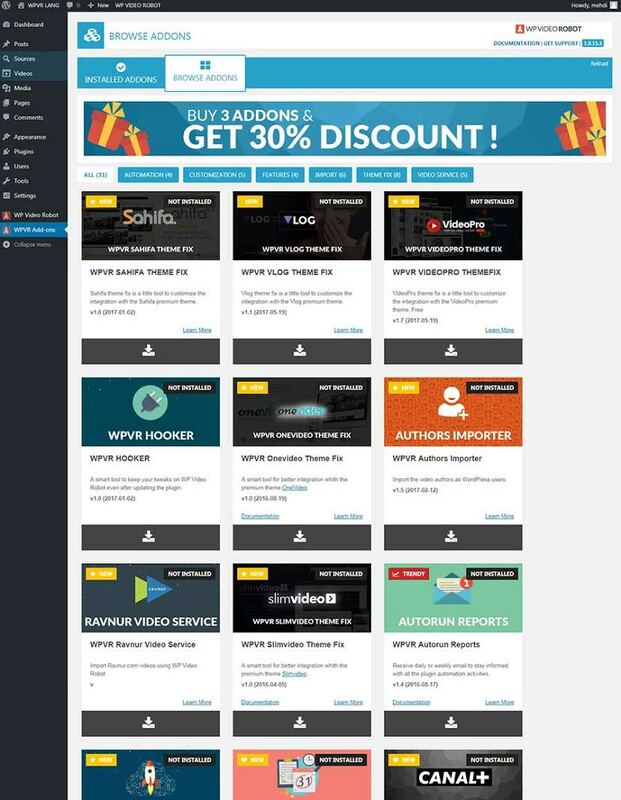 With the WP Video Robot addons, you can extend and tailor the plugin to suit your needs. What are addons ? Addons are some extensions to enhance and add powerful functionalities to the plugin. There are packed as regular WordPress plugins and are available on our official store. To install an addon, simply get the zip file from the official store. Then install it as any regular WordPress plugin. Finally head to the Browse Addons screen to manage it or activate it. Have an addon idea ? WP Video Robot keeps any done action on record. On this screen you can follow/control all the work that has been done manually or automatically.You can show Sources execution logs only or Video import logs only. Also you can narrow the results to one particular source if you want. For performance purpose, when WP Video Robot autorun sources, it doesn't add all the videos found. It only adds limited number of videos on each execution( buffer chosen on option panel). 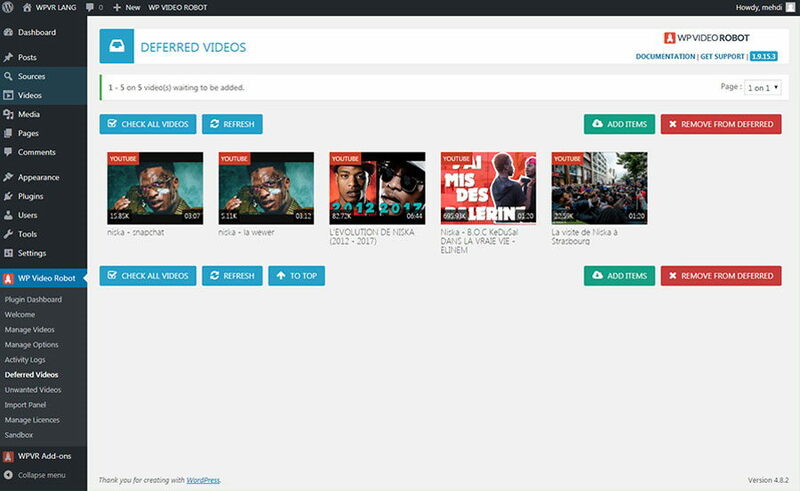 The rest of videos, called deferred videos are stored and automatically added each 10 minutes. From this screen, you can view them, add them manually or simply remove them . We were asked so many times on how unwanted videos( or junk content ) should be skipped or avoided. So we came up with a clean solution, to keep track of unwanted videos. The plugin can skip them during fetching and importing processes. You can also check them or remove some of them using this screen. This section is intended for advanced users. If you're not, please do not edit wpvr.config.php file. The wpvr.config.php file is located on the root folder of WP Video Robot. You can deeply customize the plugin by editing this file. Each constant is well commented on the wpvr.config.sample.php file, so you can know what you are changing in the plugin. Moreover, the plugin is translation ready with RightToLeft support. In the languages folder you'll even find pot file if you want to translate to your language. You can switch the whole site language by visiting Settings > General > Site Language. To change the default language of WordPress open up your wp-config.php file and find the following line. For a multi network blog you can set the language of each of the site individually. All the language settings can be setup in the network admin screen. This shortcode prints the real and live count of videos you have imported and published so far. It takes 4 optional arguments. Adding this argument (without any value), returns only the count number, without any labelling. Returns the video count of the given status only. Returns the video count of the given service only. Returns the video count of the given category only. Possible values : any valid category slug. This function returns all the custom fields values of a given video or just one chosen custom field value. Custom field name ( Possible values : video_service , video_id , video_duration , video_url , video_thumb , video_thumb_hq , video_views , EMPTY ). Video post ID. If you want to use this function outside the loop, you have to define this argument. Otherwise, leave it empty to use the post of the loop. If $field_name is defined, it will return the value of the custom field, otherwise it will return an associative array with all the field names as keys and the field values as values. Get views count of a given video. Video post ID. If you want to use this function outside the loop, you have to define this argument. Otherwise, leave it empty to use the post of to loop. It returns an integer of the count views of the given video post ID. Renders the video player on frontend. Returns the video player embed code string. Note that you need to echo that returned string to render the video player. For more help on using those functions, check out our Tutorials. - Added support for API access auto renewal (API Wizard can keep you connected forever now :) ). - Added support of PHP 7.2.x. - Added animated migration wizard to easily enable WPVR own meta tables structure. - Added WPVR_DISABLE_BLACK_BARS_REMOVER to allow import of big thumbnails that have bad quality or black bars. - Added support for AceAds used by Bimber theme. - Revamped WPVR Cache system for better performances. - Corrected post date issue when importing videos and using different timezones (WP and WPVR). - Corrected array errors when using PHP 7.2.x. - Optimized the wpvr_get_sources function to avoid slow Mysql queries. - Corrected WPVR Notices rendering error when a user have dismissed some of them. - Corrected the thumbnail issue when quick editing a video on the WordPress videos screen. - Corrected the conflict with MonsterInsights. - Using WPVR Assets(JS and CSS) on WPVR Screens only. - Corrected AutoUpdate Version checking repeated. - Removed video player iframe border on FireFox. - Corrected WPVR Notices rendering issues and conditions. - Corrected WPVR Video Wizard responsiveness styling. - Corrected Sources edition screen bug when using non english language. - Corrected WPVR Export/Import bug when using PHP 7.2.x. - Corrected Cloning Source LAst Execution Time bug. - Corrected JS animations when not using WPVR Screens FadeIn feature. - Implemented WPVR own meta tables for scalability and better performances. 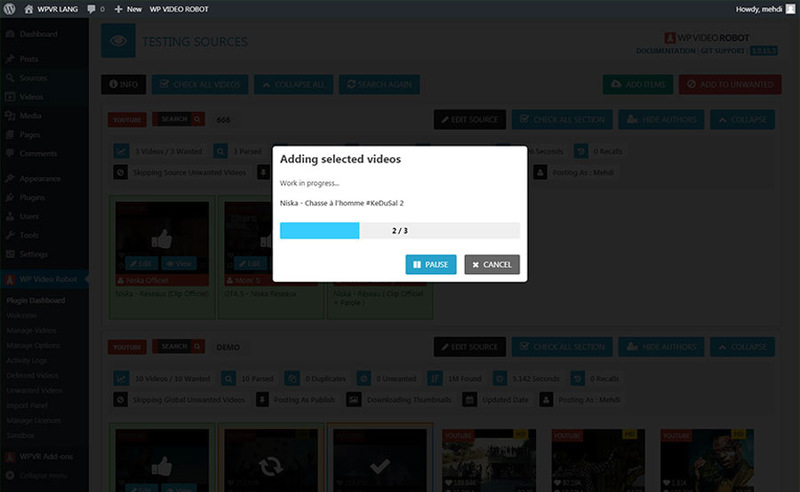 - Added Source Unwanted Videos Tab to see/edit all the videos a given source is skipping. - Added a migration wizard for a smooth meta transition. - Added hooks to programmatically add information to any activity log data. - Added constant (WPVR_FORCE_FETCH_THUMBNAILS) for advanced users to force the import and creation of video thumbnails, even if they're already on the media library. - Added HTTP Authentication constants for advanced users, to allow async executions on a http protected site. - Added fancy CheckIcon animation when saving WPVR and Addons options. 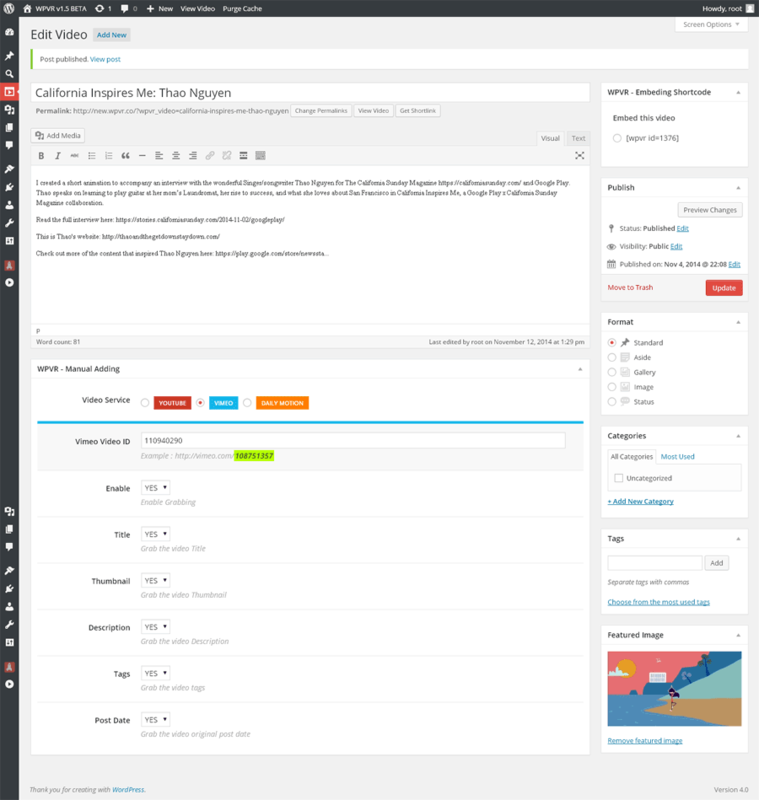 - Added Sources and Videos Meta Entries metaboxes to debug the post meta of your content. - Added dynamic API response debug through GET parameter (enable_api_response_debug) for easier debugging when testing sources. - Corrected the JS crash on WPVR Overview Charts when having categories with a quote (thanks to Michael). - Added support for PHP 7.2.0 for deprecated and obsolete wpvr functions. - Corrected the issue of maxres thumbnails not returned when using search sources. - Corrected the (re)Download thumbnails bulk action progression bug. - Corrected the Sources Listing Filtering issue when using Source Folders. - Corrected pagination issue on Woocommerce products archive pages. - Added a conditions to not test/run/export sources if they are trashed. - Corrected the save options button of WPVR and Add-ons issue. - Corrected the System Information page that was crashing on some server configurations. - Added security check to prevent running or testing trashed sources. - Corrected the deferred videos listing screen issue. - Fixed several minor bug on the WPVR Dashboard charts. - Added constant to force skipping SSL verification on all curl communications including thumbnails import over SSL. - Corrected the bulk update thumbnails crash after processing 3 videos. - Corrected add-ons options reordering thourhg the 'order' parameter. - Corrected bug when granting access to a video service API and clicking on overlay mask of the dialog. - Corrected Videos bulk actions bug when not selecting any item. - Corrected nginx configuration $_GET parameter error when using async on source executions. - Corrected Source Testing screen crashing when using WP Multisite and ASync. - Corrected WPVR Manage Licenses page messages and styling. - Corrected Async HTTP Auth problem and added a troubleshooting message when it happens. - Corrected Source unwanted adding/removing issues. Added support for Rutube Video Service. Added support for Twitch Video Service. Added Import Demo Sources feature. Added Lazy loading on all video elements rendering. Added Youtube Channel video type option to get all the videos inside a channel. Added Error message when WPVR JS code crashes because of some conflict. Added support for the latest WordPress version (4.9.4). Added a better AutoUpdate experience for both core plugin and add-ons. Added save/restore of your local WPVR config during the core plugin AutoUpdate. Added support for the new Dailymotion API new pagination system (thanks to Khalil Amor). Corrected Duration printing issue when no duration is found. Added a workaround to get more than 1000 videos from one single query. Corrected Black Bars showing up on some videos. Optimized all GIF spinners and images used by the plugin. Corrected the Manage Videos page issue when using a different post type. Corrected the autoload wp_option issue on WPVR for better performances. Introduced multi post type handling that you can define on your source. Implemented video info popovers on source testing screen. Implemented Source Search Randomize feature for easier stress testing. Revamped WPVR Top Bar and Sidebar menus to be translation ready. Implemented a step-by-step process to re-Download Thumbnails. Implemented a step-by-step process when executing dataFillers. Introduced WPVR PHP Session Cache for faster queries executions. Introduced partial flush for faster video fetching. Optimized all drop-downs populators for faster user experience. Optimized all the plugin SQL queries for better performances. Revamped wpvr_sources, wpvr_get_users and get_statistics functions. Revamped the whole add-ons structure as first steps to third-party add-on development. Corrected export bug on WP Multi-site. Corrected overwritten tags when doing manual video imports. Corrected some SQL errors on the plugin Reports and Metrics screens. Corrected flush bug when emptying trash or deleting videos. Corrected Imported/Deferred/Unwanted mechanism when fetching or adding videos on both Async and Regular executions. Corrected the re-Download Thumbnails issues on Youtube. Added a hook to define internally private custom post types to avoid conflicts with popular plugins or themes. 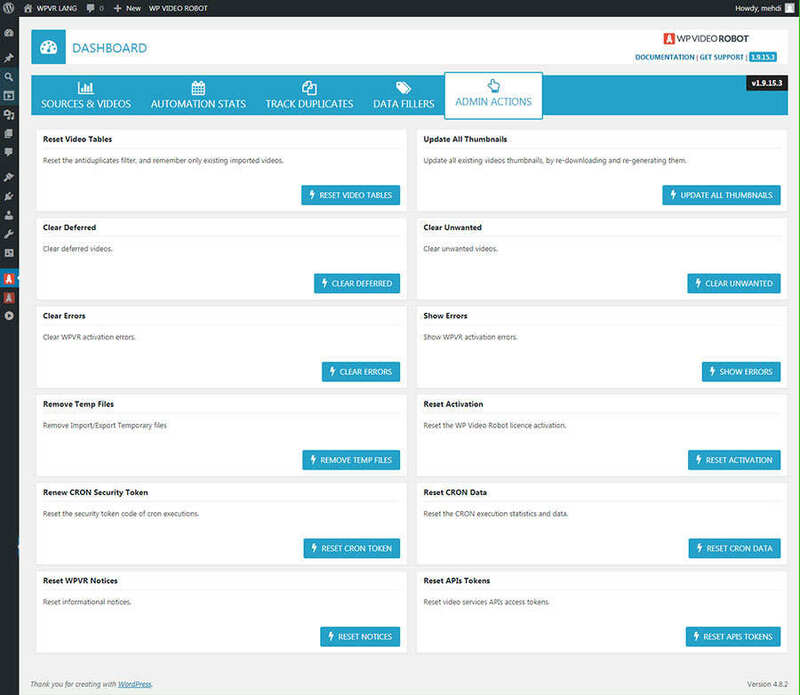 Corrected the Automation Dashboard boxes ordering and layout. 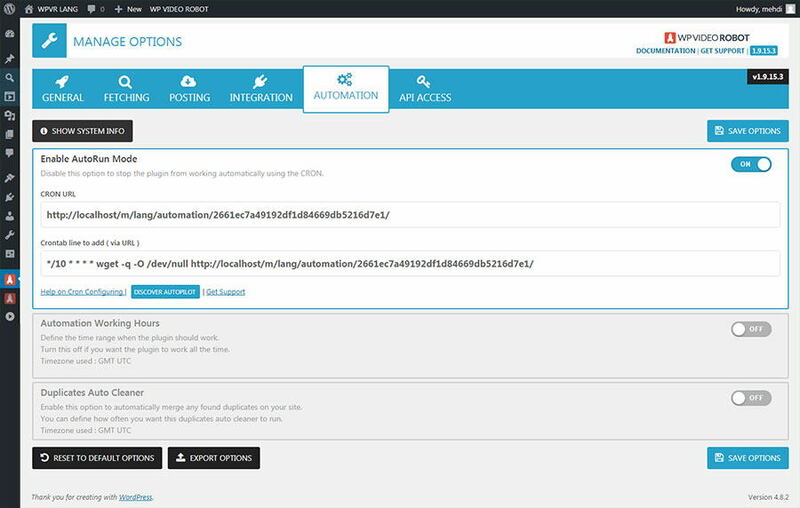 Corrected the link of service API keys creation tutorials on WPVR Notices. Removed View Source Stats link when source is not yet saved. Corrected mb_strtoupper error on some server configurations and on chinese translations. Corrected Clear Activity Logs button issue. Added backend video filtering by video ID. Corrected WordPress Multisite Activation issue. Corrected JS conflict with some rare themes. Corrected No Name Source confirmation bug. Added Source tabs for a better usability. Fixed the WPVR Permalink Rewrite issue on multisite. Fixed the reset of source execution counters on source import. Fixed misterious deletion of wpvr_video items when using the VideoPro Recommended Series Widget. 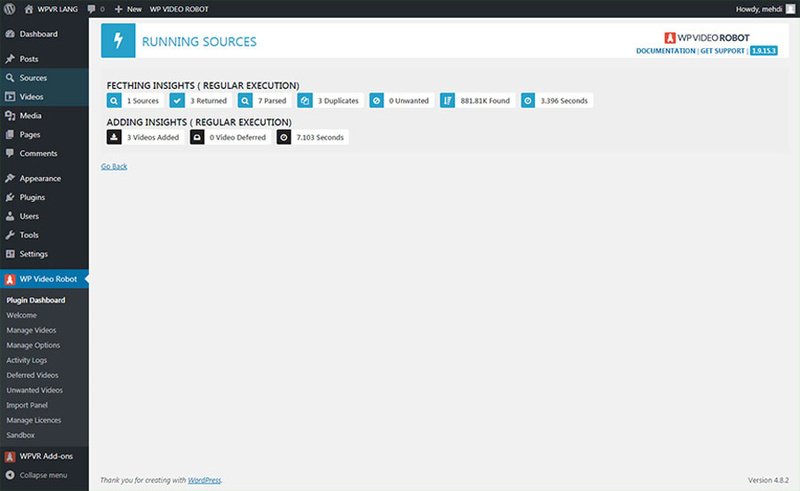 Added Source Metrics charts to have an overview of your source executions. Added support for Conditional Logic Rules insights. Added support for Conditional Logic Actions. Added the 'Skip Both Source and Global Unwanted' option for each source. Revamped Automation Stress Charts for better readability. Added Reset Source Stats button. 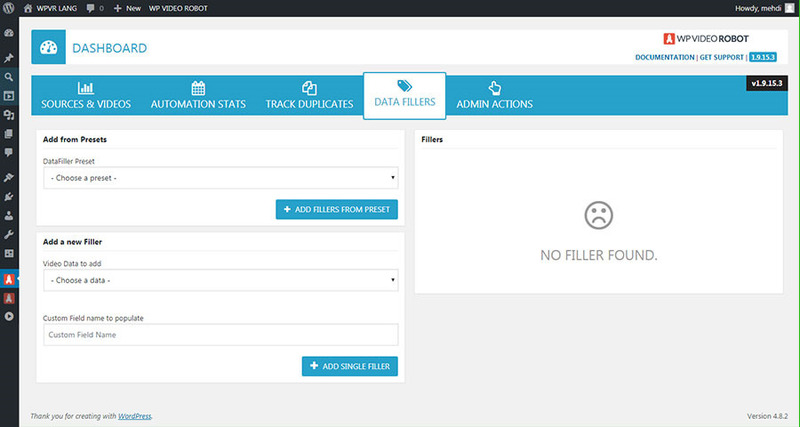 Added Filtering activity logs by source. Added explanatory message when changing Imported Video Post Type option. Added Recent Activity Dashboard Widget to overview all the Source executions and video adding metrics. 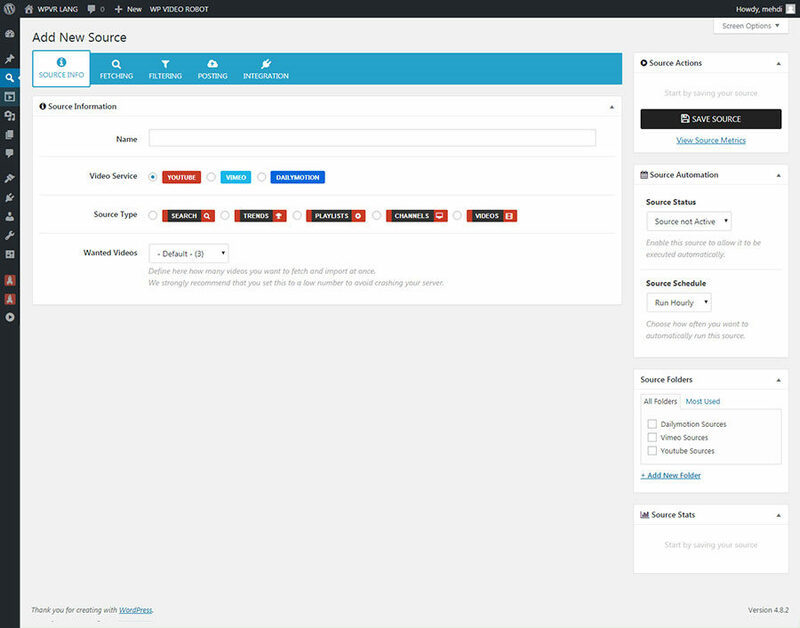 Added DEV Mode post ID printing next to title on the backend admin lists. Corrected several video import bugs. Added support for Youtube Hybrid Source. Added support for Master/Workers new addon. Added a better implementation of HTTPS. Added support for the latest ChartJS version (2.0.6). Revamped all the dashboards charts using xChartJS v2. Fixed the HTTPS bug that keeps redirecting all WPVR pages to homepage (thanks to repute). Added Search Context on Youtube Search Sources. 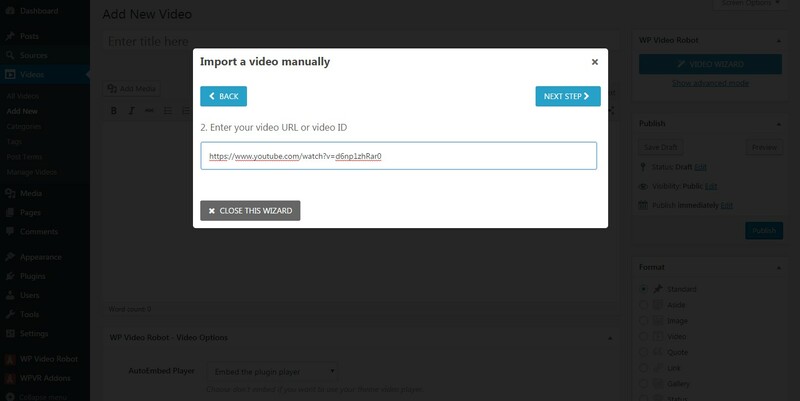 Manual adding now supports Video URL and Video ID. Added a pretty customizable cron permalink. CRON execution on multisite is now supported. Added categories filtering on Browse Addons screen. Added WPVR_DISABLE_THUMB_DOWNLOAD to disable downloading of the video thumbnail. Added a COPY button on WPVR Automation Options URLs. Corrected new update message removal on both single and multisite. 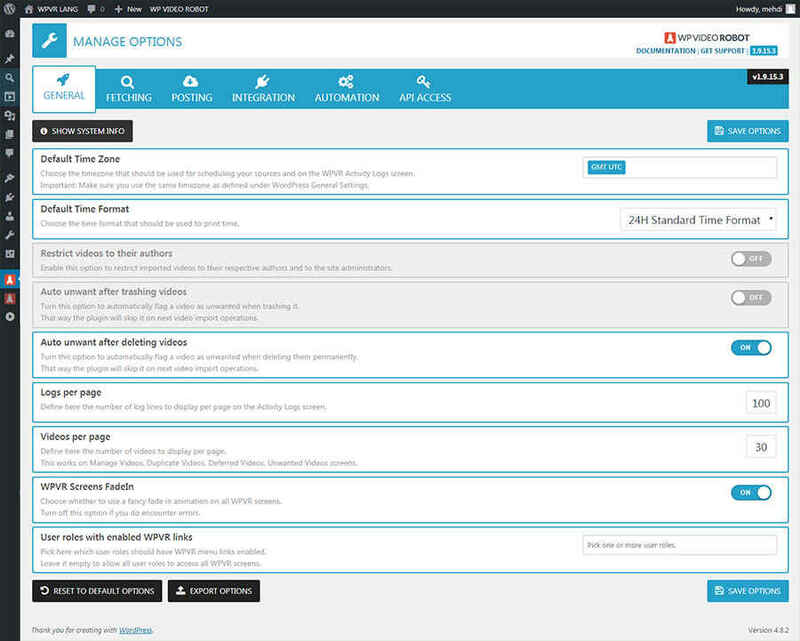 Corrected addons and plugin autoupdate on multisite. Corrected a conflict of noUiSlider JS framework. Corrected the TMP database entries async bug. Corrected the permalink 404 error on first plugin activation. Corrected Deferred and Unwanted list pages pagination bug. Adapted the cron data file to multisite installations. Added a Welcome screen with "Import Demo Sources" button. Redesigned the TEST SOURCE SCREEN. Added groupped Sources Folders actions. Improved CRON CLI executions and reports. Added System Info Export to Text button. Corrected the autoembed_done autoinclude bug. 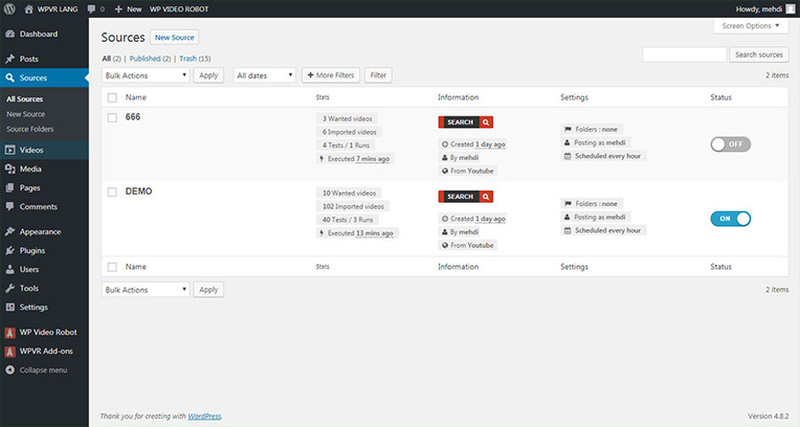 Corrected some theme conflicts with the new get_themes_mb feature. Corrected some JS error when clicking buttons. Fixed the tinyMCE error on addons options screen. Corrected some CSS conflicts on backend with other plugins. Corrected DataFillers screen JS errors. Corrected Youtube Channel ID retreiving errors (thanks to Joanny and José). Fixed the tags being imported even if not wanted (thanks to Joanny and José). Fixed the Stress Graph JS bug. Fixed frontend error when a video service is disabled. Corrected the JS error on WPVR dashboard thrown by a category containing a quote. 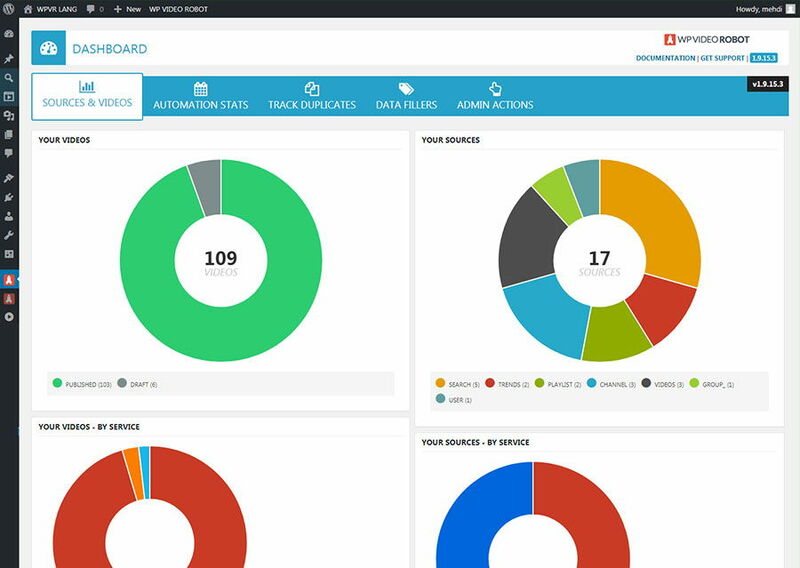 Corrected the WPVR dashboard Sources colors bug. Corrected Source Service Labels and Source Types bugs on Activity Logs. Added Execution mode and Execution time to Activity Logs. Corrected some buttons JS Errors. Corrected objects export known bug. Implemented a better timezone selector. Implemented expiration notices for addon licenses. Added Changelog reader on welcome page. 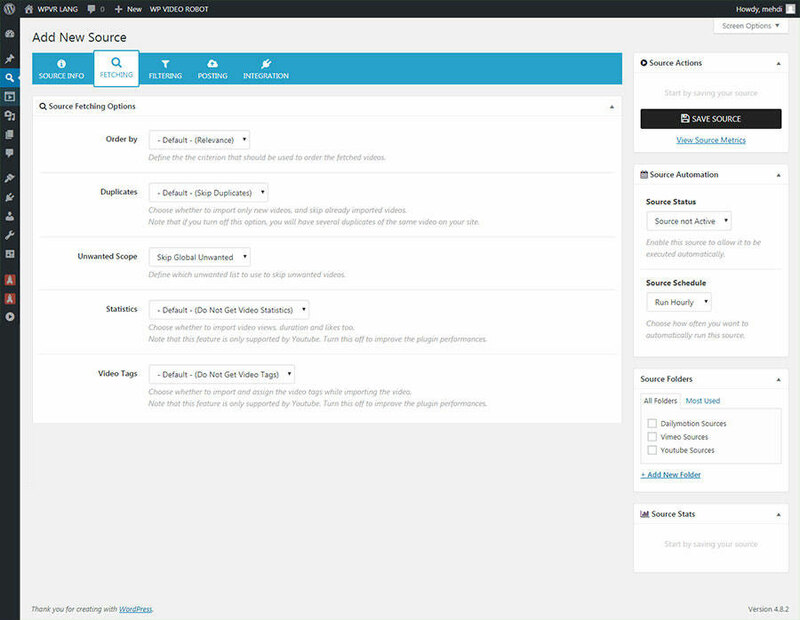 Added a admin top bar menu for WP Video Robot links. 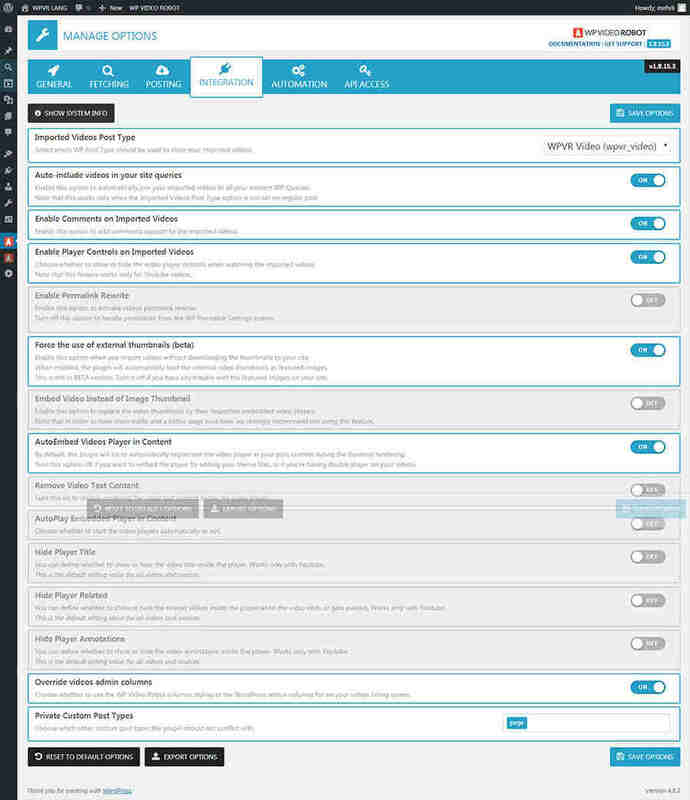 Added a plugins page menu for main WPVR links. Redesigned bulk actions for sources and videos. Added Server Software to System Info. Corrected the loading animation on JS buttons. Corrected the dashboard CRON message timezone. Corrected Dailymotion text content bug (thanks José). Added video and souorces custom post types support hooks. Corrected async actions url bug on some server configurations. Added links to welcome page icons. Corrected the 'player instead of thumbnail' option bug (thanks to keithkraker). All metaboxes defined for regular posts now supported by imported videos. Sources Folders to organize your sources. Managing Unwanted Videos to refine fetching of better videos. Better Single Source edition Action Buttons. Added pagination to deferred and unwanted videos screen. Added Global Publish Date filtering parameter. Corrected Error on Dashboard / Sources Screen. Corrected Videos filtering known issue on redirection. Adapted the WPVR backend interface to mobile. Corrected a http referrer WP bug. Added standalone video services support. Added CRON path execution support. Brand new API Access interface. Added Videos Screen EDIT/PREVIEW buttons. Enhanced the plugin screens loading with fading. Adapted all the plugin screens to mobile. Fixed sources graph bug on WPVR dashboard. Fixed user roles restriction bug. Fixed Dailymotion player issue (thanks to Carlo Bartozi ). Fixed default options init bug. Corrected errors on dataFillers ajax communications. Added WPVR_IS_LOCKED_OUT constant to prevent from being locked out the plugin. WPVR CRON is now available using php command line. Added 'Toggle All Grabbings' button on manual Adding screen. Added performance warning to avoid server crash due to misconfiguration. 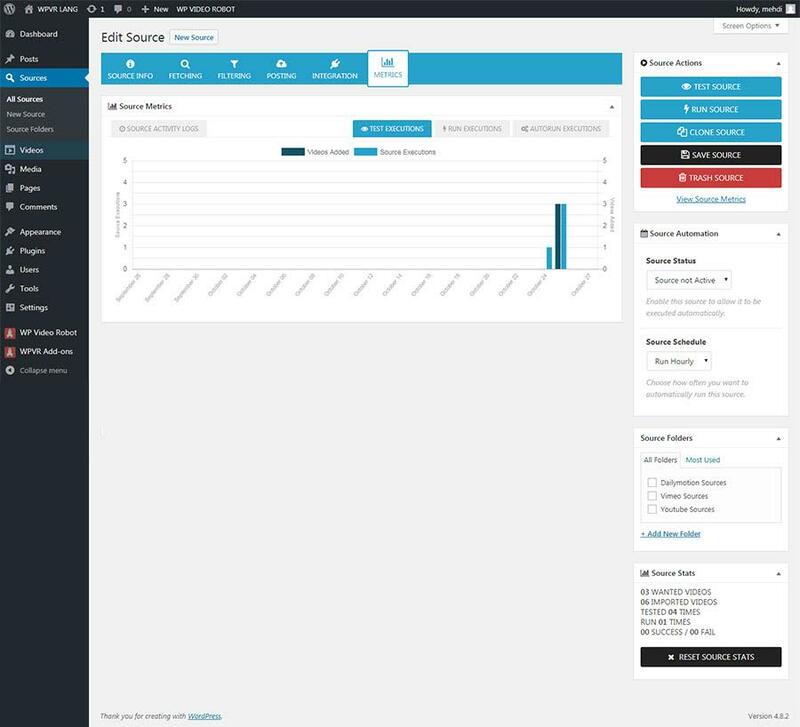 Added Reset CRON Data admin action. Improved Ajax communication to avoid crashing when illegal strings are echjoed by other plugins. Fixed autoupdate bug (thanks to Jorge). Add Default choice for Video Duration Filter. Add Default choice for Video Quality Filter. Fixed 'Get Full Description' option bug (thanks to Jorge). Fixed HTTPS embed bug (thanks to Nate). Fixed the trashed sources that were still reachable by cron. Added Get Video Full Description Option. 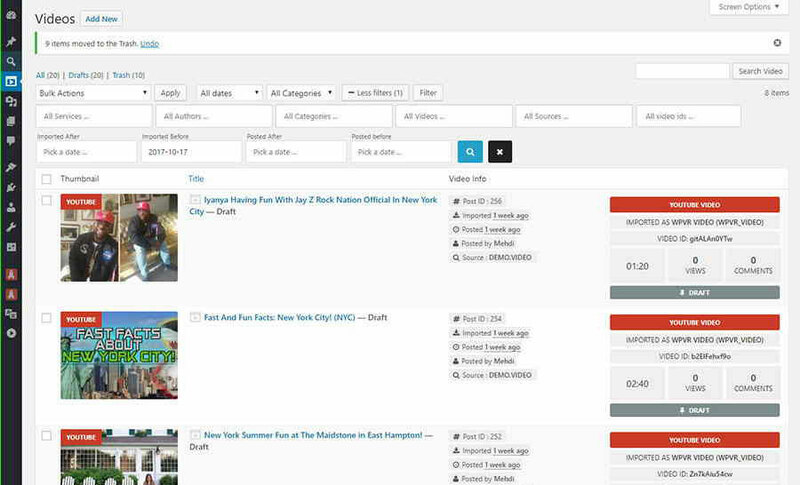 Advanced Source Filtering : by publish date , by video quality, by video duration. Multiple testing tabs or windows now possible. Added HTTPS Video Url to dataFillers. Added Dynamic Video Views dataFiller to automatically fill/update your theme custom fields with the updated video views. Added Dynamic Custom Post Type Skipper to avoid conflicts with other plugins. Added ESC for closing dialogs. Corrected vimeo tags import bug. Corrected the addons reloader bug. Increased security in API communications. Fixed the JS buttons spinner bug. Improved the youtube fetching by not geting tags of already imported videos. Corrected Vimeo Video Fetching bug. Added loading to thumbs on testing screens. Permalink Rewrite Rule with 3 options : no base , category base , or custom base. Filtering by categories on Videos Manage screen bug fixed. Added Columns to sources and videos list screens to improve overviews. Corrected including shortcode known bug. Remember you did not just buy this plugin, you also bought our support. We are here to help so feel free to drop us a line in forums if you need assistance. Also, we would appreciate if you rate this item on codecanyon.